snow ...... I've neglected my blog - I'll try to post slightly more often. The warmer weather is here - so of course I get interested in snow. 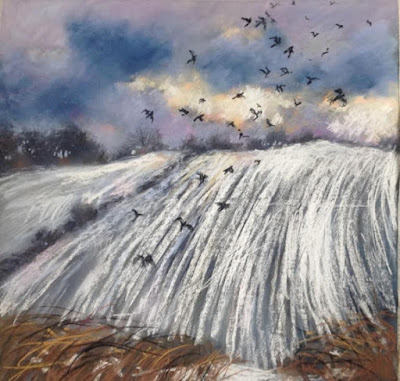 It started because of a trip to the Cotswolds to see a Kurt Jackson exhibition in April - there was incredibly late snow on the hilltops looking wonderful. That led to one painting and made me revisit sketches I did of a very early snowfall one November and work further from those. This is from the sketches done when we had and unusual very early snowfall in November, when there were still hints of autumn colour. As I looked at the field a flock of birds took off, The light in the sky was glorious and the patterns of the ploughed field - everything just added up to one of those perfect moments. The birds have flown and the light is fading in this one.